This tattoo really reminded me of a recent movie I saw, ‘Apocalypto’. This gentleman here has really roved in for a brave tattoo I must say. A crouching tiger fusioned with flowers and other details is seen inked. Seems like the tiger is ready to pounce on its prey with its fierce eyes glowing. Tribal tattoos have come a long way from being black colored to now having an array of color. This one is colorful as well. Makes me look at it and actually think of the concept behind it. 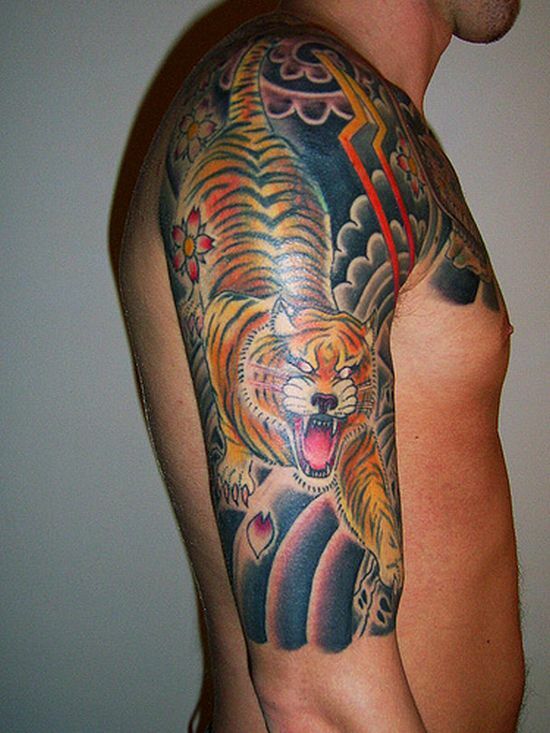 I wonder why this man has offset the dark image of a tiger with the sweet image of a flower. Talk of symbolism and you would never know what is going on inside a tattoo lover’s mind.